may have less competition, and can save you time by filtering leads to reach a highly targeted audience. Beginner and intermediate users of YouTube may learn time saving tips to monetize their broadcast and create a repeatable video marketing system. Using content development based on business objectives, readers will learn to rank well and be found by their targeted audience. When we think about the fundamentals behind a business plan, we should realize it means making a prediction from an analysis of variables. This is a good approach to video marketing. Spend some time identifying how you can be in the best location to reach a target audience. Build a plan to rank well, along with a plan to measure and evaluate results, before even beginning to create a video. This ensures that when you do start to film, you will already know that there is a demand in the market for your product or service. You will already know how to market it, and what results you can reasonably expect when your videos goes live. Tracy Foote is an entrepreneur with an Internet business since 1999. She runs three YouTube channels and keeps current through marketing conferences, seminars, webinars, channel subscriptions, and podcasts. 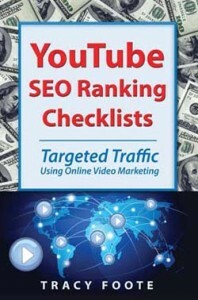 She shares her top leading video marketing ideas for beginner and intermediate users of YouTube.